The nearest major railway station is Visp. From there postbuses takes you in direction to Saas-Fee (approximately 50 minutes). 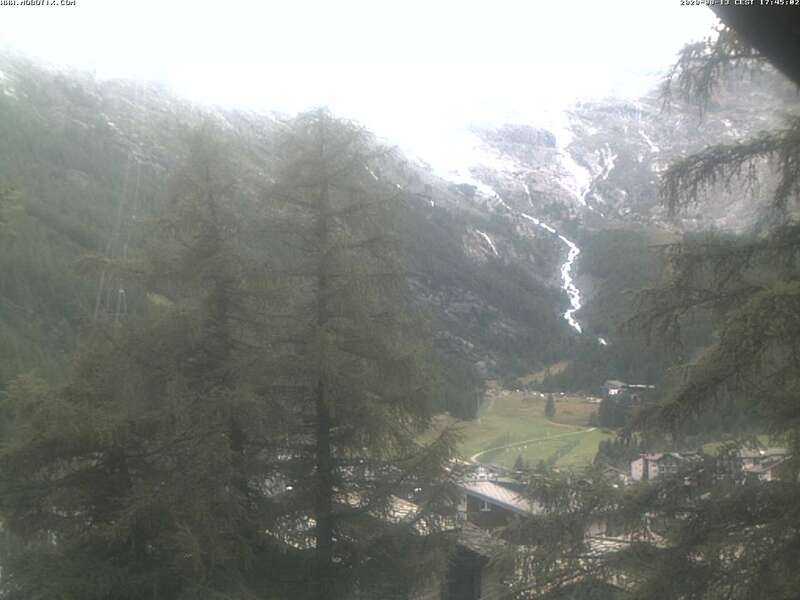 Please note that Saas-Fee is free of cars. There are up to 2 connections every hour. In the evening the last bus leaves Visp at 10.40 p.m. Friday and Saturday at 11.40 p.m. 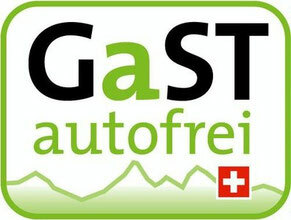 Motorists coming from the north arrive via Bern through the Lötschberg (train), from the east via the Furka pass (or train), from the south via the Simplon Pass. 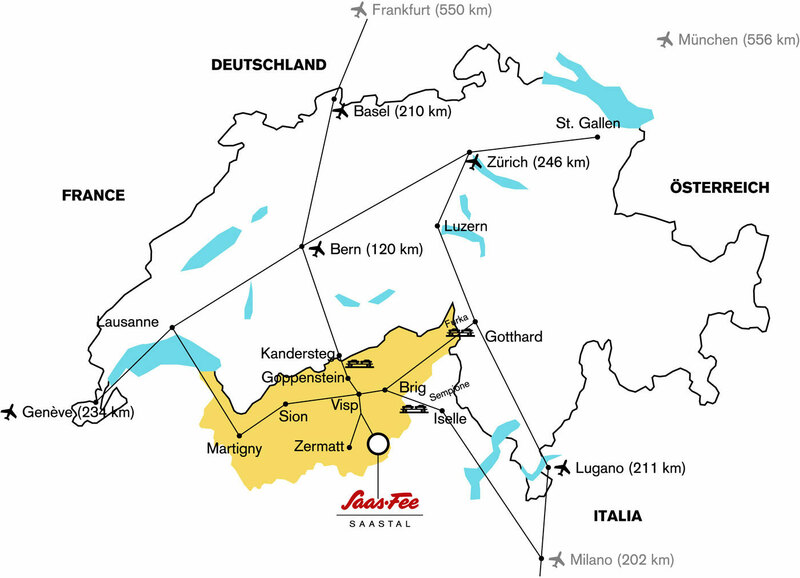 From western Switzerland you reach Saas-Fee via Lausanne, along the Rhone valley. After a scenic drive overlooking steep mountainsides and deep gorges, you will arrive at the entrance to the car-free village of Saas-Fee. Saas-Fee is car-free since ever. Enjoy fresh clear mountain air upon your arrival. For your trip to car-free Saas-Fee we recommend you public transport. Thanks to the NEAT railway tunnel the "Pearl of the Alps" Saas-Fee is to reach faster. The nearest major train station is Visp. 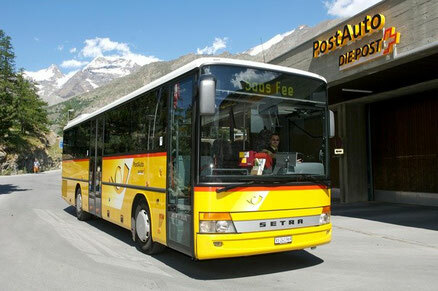 From there you can take regular buses (about 50 minutes drive) to Saas-Fee. During the day there are up to two connections to Saas-Fee every hour. 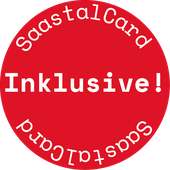 For more information please visit www.sbb.ch. When you arrive here in Saas-Fee please pick up your luggage at the luggage counter. Opposite the luggage counter you will find the tourism office and public telephone boxes. For the transportation of your luggage, you can call an electrical taxi. Saas-Fee provides 1800 indoor parking spaces and a further 1200 outdoor parking spaces. The parking fees are everywhere the same. Therefore we suggest you to use the multistorey car park. When arriving in Saas Fee, please enter the car park. From that moment on, you can enjoy your holiday without a car. On the transfer terminals A or B you may unload your luggage. Every column has its own number. Please memorize it! Now please park your car in one of the storeys below and memorize the floor on which you park your car. On certain columns you will find telephones. Please call a taxi . The electrical taxi will pick you up then within a few minutes and bring you directly to the "Alpenfirn". 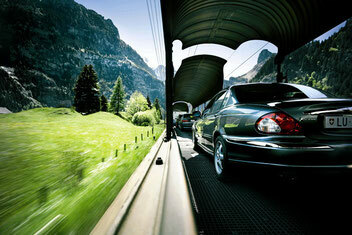 If it can be organized, we pick you up with our electrical car from the parking or from the bus station. Please contact us therefor before your departure at home. Phone number 0041 / (0) 27 957 28 79 or mail us at info@alpenfirn.ch. Alternatively, you can lend at the tourist office Saas-Fee (against depot) or directly from us (to borrow free of charge at your disposal) a hand cart to transport the luggage. Distance from the parking to the "Alpenfirn" - about 10 minutes to walk.